Just Shutters Stevenage are your local experts in providing beautifully bespoke shutters to the Stevenage area and surrounds. Our shutters experts are passionate about providing a luxury product coupled with an unrivalled level of customer service – contact Just Shutters Stevenage on 01727 221 298. 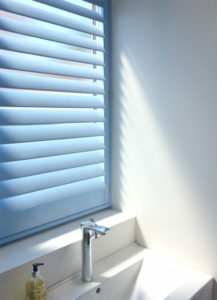 Shutters are a window fixture, providing a luxury alternative to curtains and blinds. They provide a sense of grandeur to any interior, allowing you to create a truly bespoke look due to their extensive range of materials and finishes. Browse our photo galleries to get inspired about the possibilities in your home! Furthermore, our shutters come with a lifetime guarantee. As a result, you can rest assured that they are a wise (and beautiful!) investment. Just Shutters Stevenage is part of Just Shutters Hertfordshire. This division is run by husband and wife team Brooke and Tom Parrott. With their extensive experience in the shutter industry, as well as their passion for providing excellent service, you can rest assured your in good hands. Call them on 01727 221 298 to discuss the possibilities of shutters in your home. Alternatively, use the buttons under the video to book a home design visit or download our brochure.